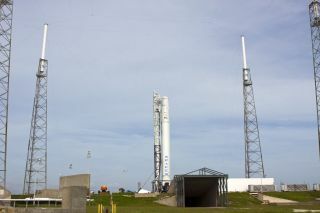 SpaceX's Falcon 9 rocket sits ready for a launch dress rehearsal at Florida's Cape Canaveral Air Force Station ahead of the Dragon space capsule's first contracted cargo run to the International Space Station. A private space capsule's first contracted cargo mission to the International Space Station is slated to launch Oct. 7, NASA officials announced today (Sept. 20). SpaceX's robotic Dragon spacecraft is set to blast off atop the company's Falcon 9 rocket from Florida's Cape Canaveral Air Force Station at 8:34 p.m. EDT on Oct. 7 (0034 Oct. 8 GMT). A backup launch opportunity is available the following day, officials said. The mission will kick off Dragon's first-ever bona fide supply run to the station. California-based SpaceX holds a $1.6 billion NASA contract to make 12 such unmanned flights. When it leaves the pad Oct. 7, Dragon will be carrying about 1,000 pounds (454 kilograms) of supplies, officials said. Much of the gear will support the 166 different scientific investigations — including experiments in plant cell biology, human biotechnology and materials demonstrations — planned during the station's current Expedition 33. If all goes according to plan, Dragon will rendezvous with the station on Oct. 10, at which point Expedition 33 commander Sunita Williams of NASA and Japanese astronaut Aki Hoshide will grapple it with the orbiting lab's robotic arm. Dragon will stay attached to the Earth-facing port of the station's Harmony module for several weeks while the Expedition 33 crew unloads the capsule and then loads it back up again with cargo to return to Earth. Dragon is scheduled to depart the station in late October. It will splash down in the Pacific Ocean, carrying 734 pounds (333 kg) of scientific materials and 504 pounds (229 kg) of space station hardware, officials said. The Oct. 7 flight won't mark Dragon's maiden mission to the $100 billion orbiting complex. In May, Dragon became the first private vehicle ever to visit the station during a historic demonstration mission that sought to gauge SpaceX's readiness to begin its contracted flights. NASA also inked a $1.9 billion deal with Virginia-based Orbital Sciences Corp. to make eight unmanned supply runs to the station with its Cygnus spacecraft and Antares rocket. Orbital plans to fly a demonstration mission to the orbiting lab later this year.